Turner Classic Movies' Tiffany Vazquez remembers the late Robert Osborne. 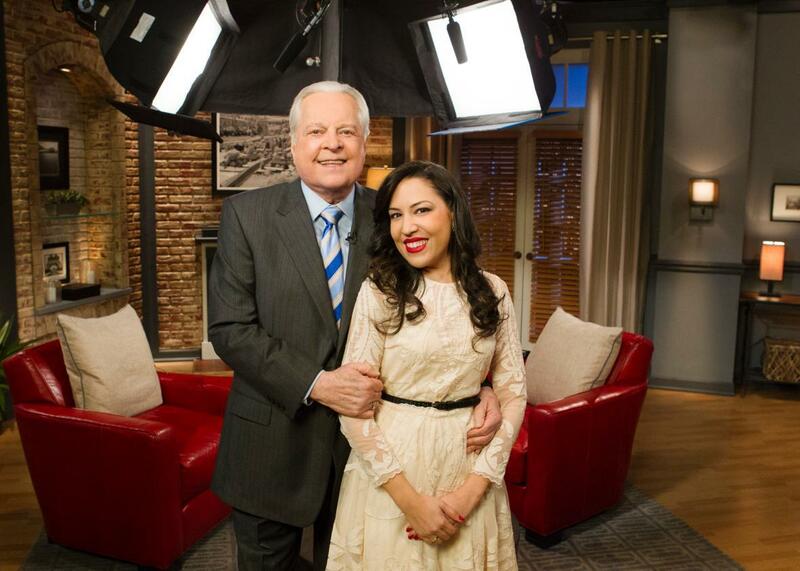 Robert Osborne and Tiffany Vazquez on the Turner Classic Movies set. Since I became the Saturday daytime host on Turner Classic Movies in June 2016, I’ve told the story of how I got to be such a huge TCM fan many times. (The short version: I saw It Happened One Night in college and wanted to know more about classic film.) But I always omitted a very personal part of the story. After reading many other heartfelt stories from fellow TCM fans over the past day, I now feel more comfortable to share it. I did want to watch more classic films after seeing Frank Capra’s 1934 blueprint romantic comedy, but I started watching TCM almost 24 hours a day because it was the only comfort in the process of grieving a friend’s death. I could watch a daylong tribute to Katharine Hepburn and feel human again. I could laugh again. I could cry for reasons other than my personal pain, which was a relief. To this, I owe all credit to Turner Classic Movies, and especially to Robert Osborne. My story is not unique. Countless people have found solace in this network that is so much more than a TV channel. Robert’s wisdom, grace, and eloquence have seen us through hard times. We welcomed him into our living rooms, excitedly waiting to hear his thoughts on every film he introduced. It didn’t take long for me to realize that I desperately wanted to do what he did: provide information about, and, hopefully, insight into, an art form that immerses us in human experiences and thus increases our empathy and brings us closer together. Robert Osborne is how I found out that a person could be a film historian. Robert Osborne is the reason why I applied to New York University for a master’s degree in cinema studies. I first saw Robert in person on April 2, 2011. It was during one of TCM’s “Road to Hollywood” nationwide screenings leading up to the second annual TCM Classic Film Festival. That evening, Robert introduced The Manchurian Candidate with Angela Lansbury in person. I sat in the second or third row, stage left, and eventually Robert came into the venue and sat two rows in front of me. I was overwhelmed, staring at someone who I didn’t personally know but had made an indelible impact on my life. I would actually meet Robert just a few weeks later, on the final night of the TCM Classic Film Festival in Hollywood. I was heading to my seat as he was going to the stage to introduce Fantasia, and we crossed paths. I smiled at him, and before I could even tell him how honored I was to meet him, he hugged me and asked what films I’d enjoyed most at the fest. I’d later learn that was a signature move of his—making the conversation all about you and never about him. Robert and I would meet again three years later. I was one of 20 fans picked as a guest programmer to help celebrate TCM’s 20th anniversary, and I had the honor of introducing The Naked City on air with Robert. I knew that being on set that day would be one of the best days of my life, but I didn’t know it would be a beginning step in my career. I wish I could accurately describe how thrilling it was to watch Robert work on set, but if you’re a TCM fan, I probably don’t need to. It’s that same feeling you get when you watch anyone do what he or she were born to do. Now that I have the honor of working with the same people Robert Osborne and Ben Mankiewicz worked with for decades at TCM, I can tell you that every person who works there contributes to its integrity. They are thoughtful, creative, brilliant movie lovers who have contributed as much to the network as Robert did himself, which he would gladly have admitted. And as iron sharpens iron, Robert Osborne and TCM elevated the status quo. The impact of Robert’s work will be felt as for as long as classic film fans exist. He was our representative and our teacher. So here I find myself in a strange circle, once again finding solace in TCM over the loss of an incredible life. If there’s one thing I am thankful for, it’s that we all know exactly how to pay tribute to someone who gave us so much. Share your love of classic film. Be passionate. Welcome new classic film fans. Lose yourself in movies. And never, ever forget the legends who contributed to Hollywood magic. Robert Osborne is one of them.